1. I sometimes wish my blog was private. I'm a word processor, meaning I process things through words/writing. I have some stuff I'm processing and yet this forum doesn't feel quite private enough these days. I'm afraid my husband is tiring of my verbal processing though he'd probably never admit that. 2. I took the kids to see Soul Surfer on Saturday. It was EXCELLENT! 3. I love Sour Patch Kids. I ate a whole stinkin' box all by myself at the movie. 4. I am feeling MUCH better! Super thankful for that! 5. John was in Oregon the last several days. He sent me this pic (Multnomah Falls) on Saturday and asked me to start searching vrbo.com for some places on the coast this summer. He didn't have to ask me twice. 7. We only have 27 more days of school. Abbey technically only has 25, but Will and Sarah have 27. That's less than six weeks until summer! Woohoo! 8. Abbey has decided she likes white American cheese since trying it on her sandwich at Subway the other day. However, she insists on it being white American and she insists on having me cut it into triangles like they do at Subway because that's "the only way it tastes right". She packs a turkey sandwich on french bread in her lunchbox every single day, but Monday she requested turkey with triangle cheese on Italian bread. I just sliced french bread differently and told her it was italian. She totally bought it. *By the way, I'm so thrilled she's eating cheese on her sandwich that I don't even mind cutting it in triangle shapes! 9. Our television remote is broken. The volume control works but the channel control doesn't. It is super annoying to have to get up to change the channel manually. Good thing we have slaves, er, I mean children. 10. We filed an extension for our income taxes. That seems to be our MO. Modus Operandi. 11. John and I are like most couples and have days/weeks that we're either in sync with each other or entirely disconnected. We've been in a really good place lately and I am so grateful for that. I much prefer the ups to the downs. Who wouldn't? 12. I've been working on this post since SUNDAY when it was the tenth. Now it's the thirteenth. I'm having a hard time blogging lately. I have much I want to say, but again, this isn't the the place to say it. [See #1 above]. 13. I'm working on a shopping list for my big trip at the end of the week. I asked Will if there was anything he needed and without missing a beat he said, "Yeah, shaving cream". That threw me for a bit of a loop. How is he old enough to be needing shaving cream?!? Soul Surfer was seriously the BEST movie I've EVER seen!!!!!! I haven't seen any waterfalls since my trip to Hawaii in '96. Now you've made me want to see some more. I'll have to find some closer than the west coast though, that's the opposite side of the country for me. I know what you mean on #1. I haven't blogged much at all in over a month. Just too much going on in life that I don't want to share in this space. I'll get back in the groove sometime. It's ok...you can cry on my shoulder. 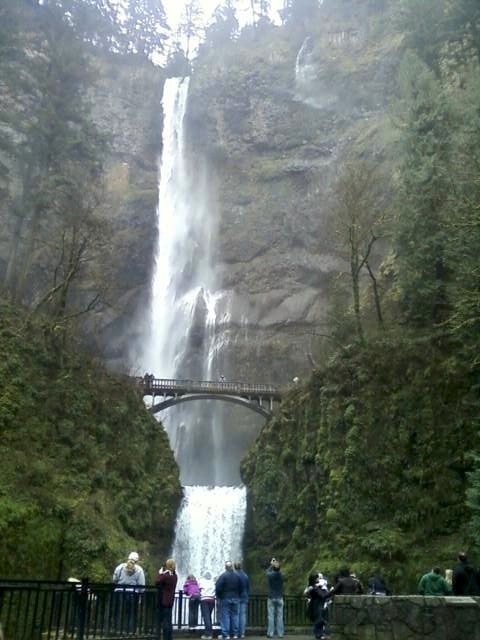 Multnomah Falls is GORGEOUS. We went there when my in-laws visited from Romania. It was/is the strangest feeling when I had to reach up and kiss my son on his prickly cheek. Still gets me every time and he's 24. Love that I can relate to most of what you have written in this post. PS...not ready for my boy to shave though....can't imagine....but it does happen! We only have 28 days left in school and I am beyond EXCITED! And it's been awhile since I'd clicked though from my reader. Love the new look! I live about a half an hour away from Mult. Falls. Did you know that there are a WHOLE lot more beautiful waterfalls to stop at on the old scenic highway where it's located than just that one? Multnomah is definitely the tallest, but my other favorites are Wahkeena and Latourell Falls. That area is so beautiful. I really want to see Soul Surfer...hopefully soon! LOVE vrbo.com! We use it all the time! We found our spring break house on the bay through vrbo, and it was one of the most beautiful, peaceful places that we have ever stayed! Have fun planning a family vacation the coast! As far as #1 - please feel free to process on here! I've got the same need to process with words to figure stuff out! So I totally could relate! There's a site called 750 words (http://750words.com/) where you can type all you want and it's private! I'm not sure if that was what you were looking for but it's a place to just type away! And no one but you sees it! That picture only intensifies my desire to visit the northern west coast (it's on my bucket list). And, while we're defining acronyms, I recently found out (last, I'm sure) that EVOO was extry virgin olive oil. Seriously. I'm at the store looking, looking, looking. And the light finally went on. My son needs to shave, but won't. He prefers to look like a hobbit, as his cheeks grow side-burn type hair, and the rest of his face is peach fuzz. Still working on a daily smackerel of deodorant with him, too. Understand about the word processing in a safe place/not husband's bleeding ears. Me too. Call me any time. I'm here, and would love to just listen. So he DID make it to Multnomah Falls! Isn't it gorgeous here?! And you BETTER let me know if you come to the coast this summer! It only takes us a little over an hour to get there!